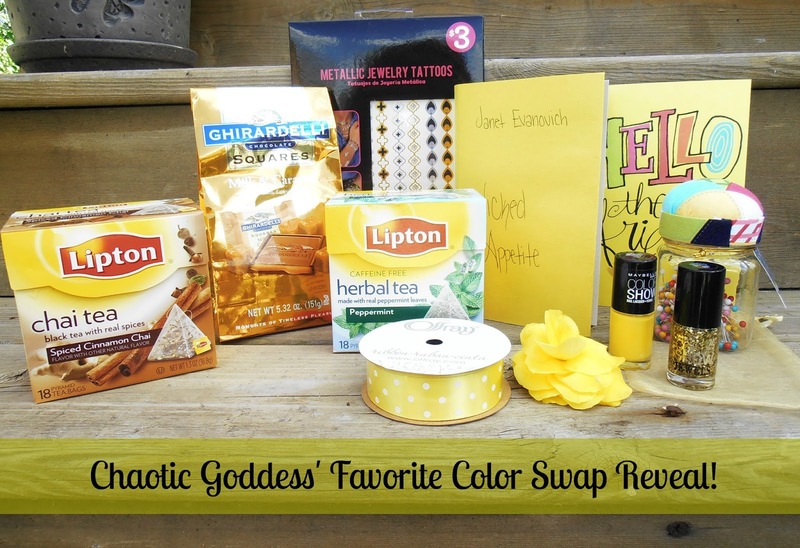 Chair in the Shade: Chaotic Goddess' Favorite Color Reveal! Any of you regular readers know I love a good blog swap. They're just so fun- you can meet new bloggers, pick out some goodies for them, and then see what they picked for you. This is my third time doing Chaotic Goddess' Favorite color swap. The first year I got an awesome purple themed package from Cindy at A Crafter's Corner and last year I got a great yellow package from Ashley at A Cute Angel and this year I was paired with Kenzie from Chasing my Extraordinary. I've finally decided that yellow is really by favorite color (and it's hers too- great minds think alike). And Kenzie did it up big! Want to see? She spoiled me! And my picture doesn't really do a good job showing all the awesomeness but here's what she sent. I loved everything she chose and just for reference, there's a begonia flower next to the ribbon that is kind of my favorite yellow shade. You can see Kenzie was right on the mark. Her blog is pretty awesome, so you should really go check her out. And, don't forgot to go to Chaotic Goddess' blog and see what everyone else got, including what I picked for Kenzie. Her post is already up. Yellow really is such a cherry color. Thanks for stopping by! I am so glad that you enjoyed what I sent! I had so much fun shopping for you :D In fact, it was pretty easy seeing as I love the color yellow too ha ha! I just had to purchase that book for you, but the red cover was driving me nuts because it wasn't yellow. How fun that Chai tea and peppermint are some of your favorites! I had a hard time choosing which flavors to send. It is fun shopping for someone who shares your favorite color. :) And when I saw what flavors of tea you picked, I thought for sure you must be a mind reader. :) Thanks again, Kenzie! What a lovely, cheerful package! That's awesome she made a dust jacket for the book...I hope you enjoy it! I haven't read any Janet Evanovich books, either, so you'll have to let us know how it is. Thanks so much for joining us for this swap! Everyone keeps recommended Janet Evanovich to me, so it's time for me to read her, and the book Kenzie bought me is the first in a new series of hers.